A major concern of most expecting mothers is knowing what nutrients are needed and how they are best obtained. This can take a good bit of research because the fetus will require an abundance of certain substances in order to develop properly. Additionally, this research can be made more difficult by mixed information coming from relatives, friends, and physicians. One nutrient that is important for expecting mothers to consider is iodine. Iodine is necessary, and especially so during pregnancy as it offers several undeniable benefits to both the mother and the child. In recent years, medical research has indicated a new risk, iodine deficiency in pregnant women and how it impacts the developing fetus. One way that iodine is beneficial to the mother is by boosting her immune system. This is crucial because a strong immune system will fight off illnesses and infections. While she is pregnant, a mother’s choices of medication are very limited, which means that her immune system may be the only defense she has against the flu. Additionally, while the baby is in utero and for several months following delivery, the mother’s immune system is also the baby’s immune system. In addition to basic immune system benefits, studies have shown that with the changes in eating habits over the past several decades, particularly due to increased consumption of processed foods, mothers-to-be are at risk of decreased production of thyroxine, the main hormone secreted into the bloodstream by the thyroid gland, caused by inadequate amounts of iodine. For most people, a daily dose of iodine comes from iodized salt which is frequently lacking in processed foods. Iodine is a vital mineral needed for the thyroid gland to produce thyroxine which is an essential hormone for the neurological and physical development of the fetus. Insufficient production of thyroxine exposes the fetus to risks of intellectual impairment, congenital hypothyroidism, and other growth disorders. Consequently, if an expectant mother’s thyroid hormone levels drop, the effect is passed on to the baby. The small butterfly-shaped gland in your neck produces hormones that drive your body and brain. Even a small malfunction in the thyroid gland results in slowing down or speeding up of the entire endocrine system which regulates all cellular, tissue and organ functions in the body through secretion of hormones. It is crucial for the normal growth and development of the fetus as much as it is for the maintenance of normal metabolism and body functions in the mother. Any disturbance in the production of the thyroid hormone leads to disruption of the body’s mechanism. Hence, if a woman’s thyroid hormone levels fall during pregnancy, the deficiency compromises the health and development of the unborn baby. Perhaps the most important way in which iodine benefits the baby is that it is necessary for the fetus’ neurodevelopment. This means that the baby’s brain and nervous system can’t properly develop without a sufficient amount of iodine. It is so essential that without the correct amount, a baby can develop neurodevelopmental disorders. In many cases, insufficient iodine intake has been linked with increased risk of miscarriage, stillbirths, and premature births. Therefore, with monitored iodine consumption, the risk of each of these outcomes is greatly decreased. Iodine also influences the baby’s metabolism, which means that it can help regulate many of the baby’s body’s autonomic functions. This is especially important in young babies because their size makes them more susceptible to the effects of temperature change. However, iodine has another advantage: scientists believe that nearly half of all infants may experience brain damage due to iodine deficiency. According to medical professionals, the baby’s brain may already be suffering from mild iodine deficiency during pregnancy, which can lead to decreased intelligence. On the other hand, research shows that the right amount of the trace element in pregnancy can increase the child’s IQ later in life. This seems difficult to predict, but due to the importance of the nervous system, it is quite possible that an iodine deficit may cause affected children to fail to reach their full intellectual potential. 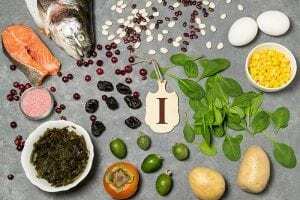 The World Health Organization (WHO) has therefore been calling for regular control of iodine supply in the population for many years in order to identify and eliminate the predominant iodine deficiency. Pediatricians are concerned that nearly a third of all pregnant women in the US are iodine-deficient and require supplements to ensure that the decreased thyroid function does not affect the baby they are carrying. It is encouraging that, by identifying the potential risk, specialists are able to better monitor pregnant women and offer them simple supplements to treat the deficiency. The state of pregnancy imposes increased demand on a woman’s thyroid gland. Any underlying thyroid hormone imbalance, even if it has not manifested itself clinically, can become much more serious during pregnancy. Hence, in planned pregnancies, it is wise to consider consuming foods with higher iodine content and using iodized salt even before the pregnancy occurs. In others, it is a great idea to start on an iodine-rich diet as soon as you find yourself pregnant. It is important to see your obstetrician for regular, routine monitoring of the pregnancy. If your doctor finds you at risk of developing iodine deficiency, he or she will advise you on how to treat it with supplements. Expectant mothers should take between 230 and 260 μg of iodine daily. To absorb sufficient amounts of the trace element, a well-balanced diet is crucial. The good news is that there are several sources of iodine that are easy to incorporate in your diet. Almost all seafood, milk, eggs, potatoes with peel provide iodine, and of course, iodized salt instead of kosher or other coarse types of salt. It is beneficial to consume a little extra iodine in foods that are iodine rich during pregnancy because the unborn baby needs it too. But always bear in mind that there is such a thing as excessive iodine which can be dangerous, especially when consuming salt. Too much salt can cause other health conditions, such as high blood pressure and harmful effects on your kidneys and heart. While there is no reason to feel alarmed by these potential risks, it makes sense to be aware of them and keep yourself and your unborn baby well-nourished and healthy throughout your pregnancy.